The South Anyui Suture separates the structures of the Chukotka and Verkhoyansk-Kolyma Fold Areas. The suture consists of ophiolites, island-arc rocks, deformed Upper Triassic and Upper Jurassic-Lower Cretaceous turbidites, and accretionary-type terrigenous melange with blocks of oceanic crust. Two main stages in the geological history of the South Anyui Suture are distinguished: (1) the oceanic stage (Paleozoic-onset of Late Jurassic), when the vast Protoarctic ocean with ensimatic island arcs existed, and (2) the collisional stage (Volgian Age-Early Cretaceous) that started with the transformation of the ocean into the residual and closing South Anyui turbidite basin and was completed by the formation of a fold-nappe structure in the Hauterivian-Barremian. In the course of collision, the oceanic and island complexes were thrust to the north over the passive margin of Chukchi Peninsula. The thrusting was followed by the formation of south-vergent retrocharriages and then by final strike-slip faulting. In the Aptian-Albian, collision gave way to extension with the formation of metamorphic cores and superposed orogenic basins. Original Russian Text © S.D. Sokolov, M.I. Tuchkova, A.V. Ganelin, G.E. 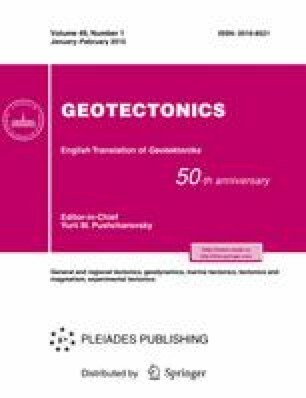 Bondarenko, P. Layer, 2015, published in Geotektonika, 2015, No. 1, pp. 5–30.